Bring your lawn chairs, a comfy blanket, a picnic and the whole family down to Wrightsville Beach Park to enjoy some great tunes and an evening of fun! The event begins at 6:30 pm and goes until 8 pm. If you can't make the first show, not to worry! This free summer concert event takes place every Thursday evening through August 6, 2015. 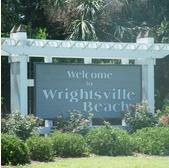 For more information, check out the Visit Wrightsville Beach website.